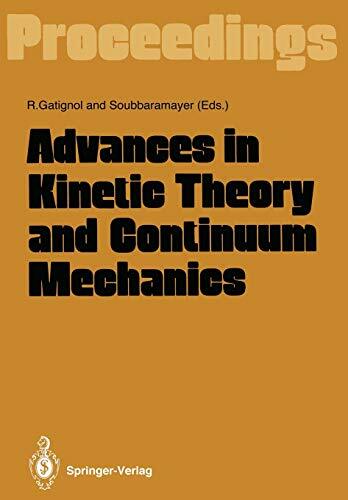 [PDF] Advances in Kinetic Theory and Continuum Mechanics: Proceedings of a Symposium Held in Honor of Professor Henri Cabannes | Free eBooks Download - EBOOKEE! Description: This volume contains the proceedings of the symposium held on Friday 6 July 1990 at the University Pierre et Marie Curie (Paris VI), France, in honor of Professor Henri Cabannes on the occasion of his retirement. There were about one hundred participants from nine countries: Canada, France, Germany, Italy, Japan, Norway, Portugal, the Netherlands, and the USA. Many of his past students or his colleagues were among the participants. The twenty-six papers in this volume are written versions submitted by the authors and cover almost all the fields in which Professor Cabannes has actively worked for more than forty-five years. The papers are presented in four chapters: classical kinetic theory and fluid dynamics, discrete kinetic theory, applied fluid mechanics, and continuum mechanics. The editors would like to take this opportunity to thank the generous sponÂ­ sors of the symposium: the University Pierre et Marie Curie, Commissariat a l'Energie Atomique (especially Academician R. Dautray and Dr. N. Camarcat) and Direction des Recherches et Etudes Techniques (especially Professor P. Lallemand). Many thanks are also due to all the participants for making the symposium a success. Finally, we thank Professor W. Beiglbock and his team at Springer-Verlag for producing this volume. No comments for "[PDF] Advances in Kinetic Theory and Continuum Mechanics: Proceedings of a Symposium Held in Honor of Professor Henri Cabannes".